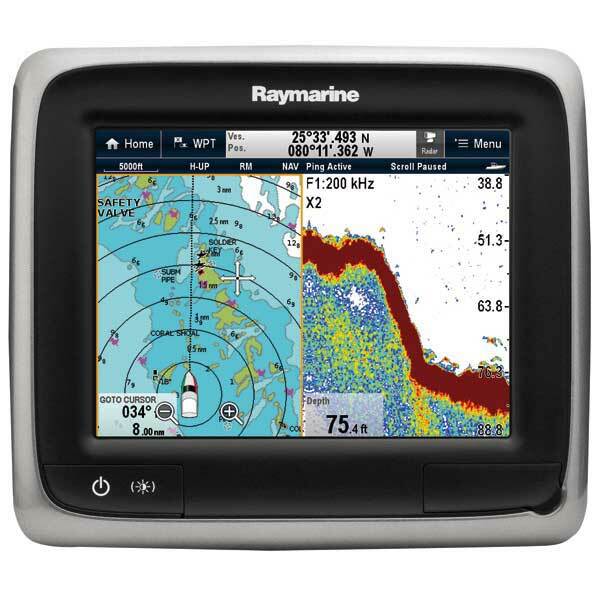 YOUR BEST SOURCE for... finding Raymarine a Series MFD - DEALS! 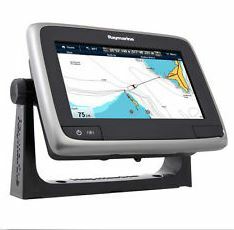 The Raymarine a75, a 7″ SuperFast, SuperBright, easy to use TouchScreen MFD that’s Networkable, Video, Wi-Fi & Radar ready with Navigation charts & internal GPS. Designed to be rugged and perfect where space is at a premium. The touchscreen design and thin bezel gives your helm a clean sharp look. The a‐Series is equipped with a super bright LED backlit display designed for sharp color and contrast in the brightest sunlight. Extremely versatile with simple and quick access to navigation applications like GPS, sonar, radar and more using Raymarine’s intuitive LightHouse user interface. Learning and using an a‐Series MFD is fast and easy. 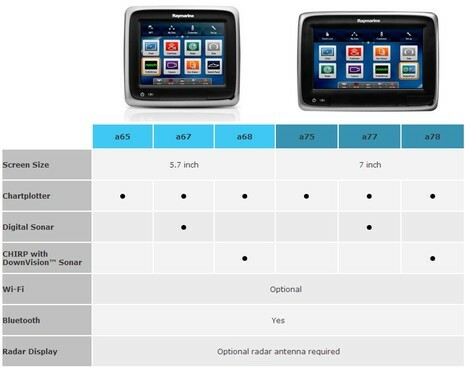 Raymarine’s new a Series multifunction displays (MFDs) receives another boost as the company releases its latest models ; expanding screen sizes to 7” and adding Wi-Fi, plus new sonar options to the extensive list of a Series capabilities. 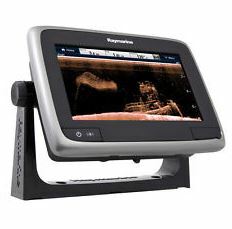 The combination of CHIRP and Downvision sonar, first seen in Raymarine’s ground-breaking Dragonfly™ which launched earlier this year, is now available in aSeries too. The aSeries MFDs feature Raymarine’s LightHouse User Interface and offer advanced navigation, sonar, and network capabilities in a compact, full-featured touchscreen display. Included are a 50 channel internal GPS and Navionics Silver cartography on microSD. 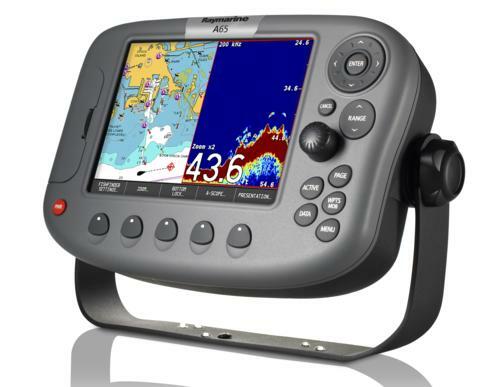 You can choose the a75 MFD for GPS navigation and networking, and the a77 MFD with ClearPulse® digital sonar built‐in for the serious angler. Add‐on options, include the RCU‐3 Bluetooth steering wheel remote. This simple 3 button RCU‐3 puts you in command of a‐Series without letting go of the wheel. The RCU‐3 can also be used as a handheld remote using the supplied lanyard. 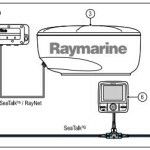 Each a‐Series features a fast Raynet Ethernet port for connecting up to 6 Raymarine MFDs, making a‐Series the perfect choice for a small boat network or part of a larger Raymarine system. 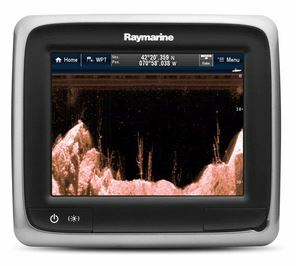 The Raynet port also enables connection to Raymarine Digital, HD Color, and Super HD Color radar systems, giving the option for a compact and affordable high performance radar system. 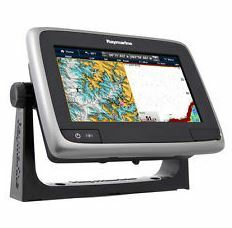 Fisherman looking for higher sonar resolution and performance can network with Raymarine’s optional CP450C ClearPulse® CHIRP sonar module. You can further expand an a‐Series with Bluetooth MP3 control and Fusion audio control. 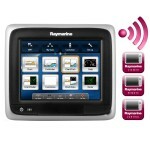 Optional SIRIUSXM receiver enables both SIRIUS marine weather overlays and SIRIUSXM satellite radio audio control. 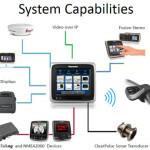 A‐Series displays also connect with NMEA2000 and Raymarine SeaTalking networks, giving you the ability to integrate AIS, autopilots and engine instrumentation. Taking advantage of engine fuel data, the new a‐Series offer a fuel manager, allowing fuel consumption monitoring and “time to empty” information along with an application providing a fuel range ring overlaid on the navigation chart, allowing you to visualise your maximum fuel range. Swipe, Touch and Navigate – very simple. 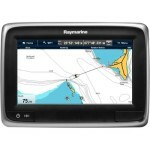 Charts Included – Available with Navionics Silver charts on a microSD card. Display radar data with an optional Raymarine Digital, HD and Super HD Color radar antenna. Easy-to-read instrumentation display transforms the a68 into a powerful information display. 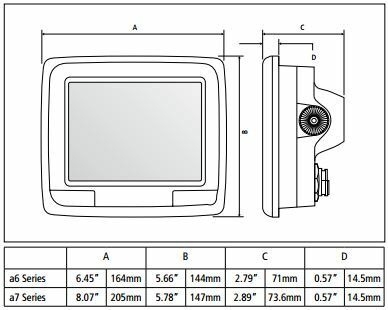 Supports IP cameras (requires ONVIF compatibility) including playback and recoed functions. 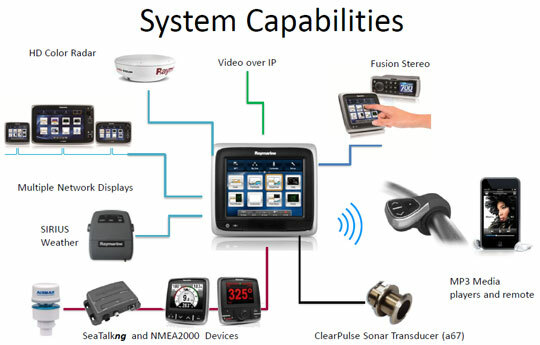 Graphical engine data display capability for NMEA2000 compatible engines. Choose an a68 MFD with built in Wi-Fi and use your mobile device to view and remotely control your MFD with Raymarine mobile apps. Weather and Radio Keep track of storms and tune into SIRIUSXM satellite radio with the optional SR150 receiver. Control your audio with Bluetooth or FUSION link with Full control of FUSION 700 Series Marine Stereos. 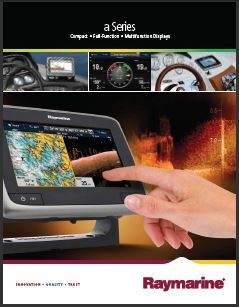 Cartography: a Series displays can be purchased with or without Navionics charts on microSD cards. 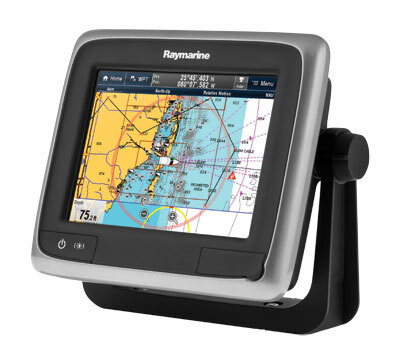 Choose models with Navionics Silver or Navionics Gold included. © 2013 All content in the public domain.